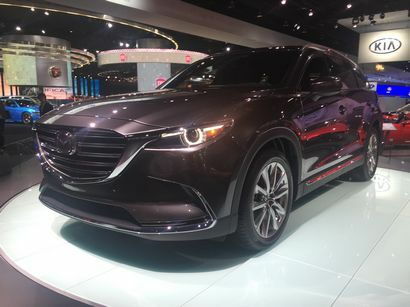 Mazda North American Operations has released pricing and model-specific equipment information for the all-new 2016 Mazda CX-9 midsize, three-row crossover. 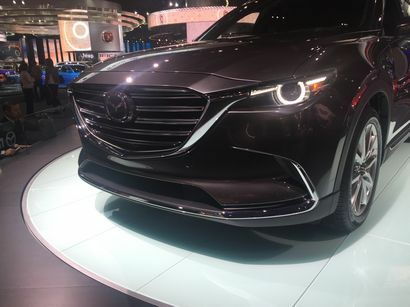 It's certainly "last, but not least" for the CX-9 midsize crossover as the last vehicle in Mazda's lineup to receive the complete Skyactiv makeover. Fortunately, in addition to the bevy of fuel-saving tech, it has the looks to go along with it as it also receives a healthy dose of the manufacturer's KODO design language – making it one of – if not THE – handsomest vehicle in the segment. But rather than continue gushing about its good looks and new tech (and although we're sure it will handle like a typical Mazda, we'll reserve judgment until we get some time behind the wheel), let's get down to some of the basics we know so far, trim level by trim level. 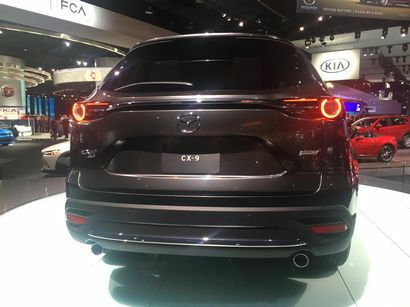 Even the base trim level, in addition to the requisite power accoutrements (windows, locks, mirrors) the CX-9 comes standard with LED headlights and taillights, 18-inch wheels and a rear view camera. 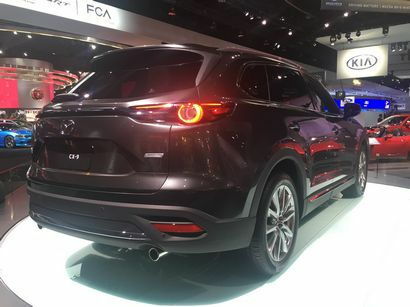 Inside are cloth seats, an electronic parking brake, Mazda Connect infotainment with Commander control and a seven-inch color display. Trailer stability assist is also standard. The optional Sport Package adds a power driver's seat, heated front seats and heated door mirrors. 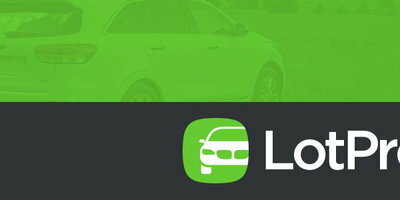 The Touring level adds such amenities as Advanced Keyless Entry, black- or sand-colored leather seats, power front seats, and an eight-inch Mazda Connect touchscreen display, an auto-dimming rearview mirror, HomeLink garage door openers, Blind Spot Monitoring with Rear Cross-Traffic Alert and a power liftgate. The optional Touring Premium Package adds automatic on/off headlights, LED fog lights, a navigation system, a premium 12-speaker Bose audio system, rain-sensing wipers, rear backup sensors, second-row window retractable sunshades, SiriusXM satellite radio, automatic Smart City Brake Support and a sunroof. Grand Touring models up the ante with additional equipment that includes an Adaptive Front-lighting System, 20-inch wheels, aluminum interior trim, an Active Driving Display that projects instrument and navigation information onto the windshield, high-beam control, lane-departure warning, lane-keep assist, Mazda Radar Cruise Control with Smart Brake Support, roof rails and driver's seat memory settings. A new trim level for Mazda, Signature models come standard with Mazda's predictive i-ACTIV all-wheel drive, which uses 27 sensors, measuring conditions more than 200 times per second to determine how to allocate power to each wheel to minimize wheel slip. Interior appointments include Auburn-colored Nappa leather, rosewood (supplied by Japanese guitar-maker Fujigen), LED signature accent grille lighting and LED accent lighting around the shifter. 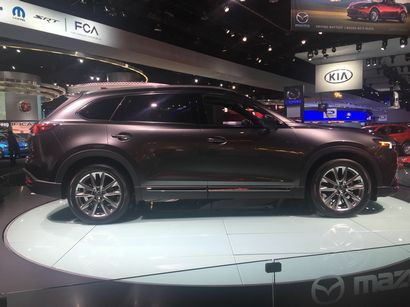 2016 CX-9s will come with a single engine and transmission choice. Under the hood is a new turbocharged SKYACTIV-G 2.5T engine, which generating 310 lb-ft of torque from just 2,000 rpm on either 87- or 93-octane gasoline. It also produces 250 horsepower on 93-octane gasoline (227 horsepower on 87-octane). With either fuel grade, FWD versions achieve an EPA-estimated fuel-economy rating of 22/28/25 city/ \\highway/ combined miles per gallon. That engine is paired with a standard SKYACTIV-DRIVE 6-speed automatic and is available in front-wheel drive or the brand's i-ACTIV all-wheel drive system. i-ACTIV all-wheel drive on all but the Signature trim level is an additional $1,800. 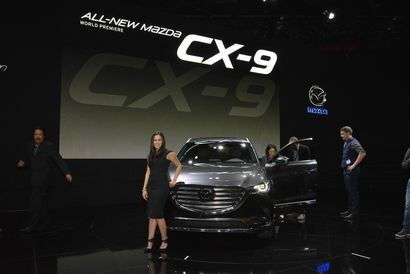 According to Mazda, the 2016 CX-9 is expected to go on sale in the U.S. in late-spring 2016 with final packaging and specifications to be released closer to its on-sale date. Manufacturer Suggested Retail Prices reflect $900 for destination and handling (it's an additional $45 in Alaska).